Barron's. 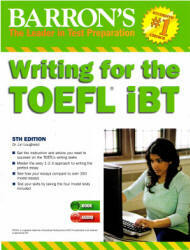 Writing for the TOEFL iBT. Barron's Ed. Series: 2014, 5th. ed. - 336p. ; 2008, 3rd. ed. - 379p. This updated manual prepares students to succeed on the TOEFL's Independent Task, the all-important essay question, and on the Integrated Task, which combines reading, listening, and writing skills. The author presents a three-step program designed to help students write like native speakers of English. His coaching entails gathering ideas, organizing details, and developing the chosen topic into clear, grammatical written English. He also provides exercises in proofreading and editing. Over 180 model essays and model integrated tasks are included for students to read and analyze. Lectures typical of those presented on actual tests are contained on the MP3 CD enclosed with the manual.